Beautifully tanned from the few days on a gorgeous beach or even boat, with a scenic background, the sort you could only dream about in the UK. Whatever your dream wedding NE Event can help in the same way they would in the UK to find venues, design receptions, entertain guests, cakes, flowers and so on, the only difference is that you would be travelling somewhere exotic and we can help with travel arrangements too. 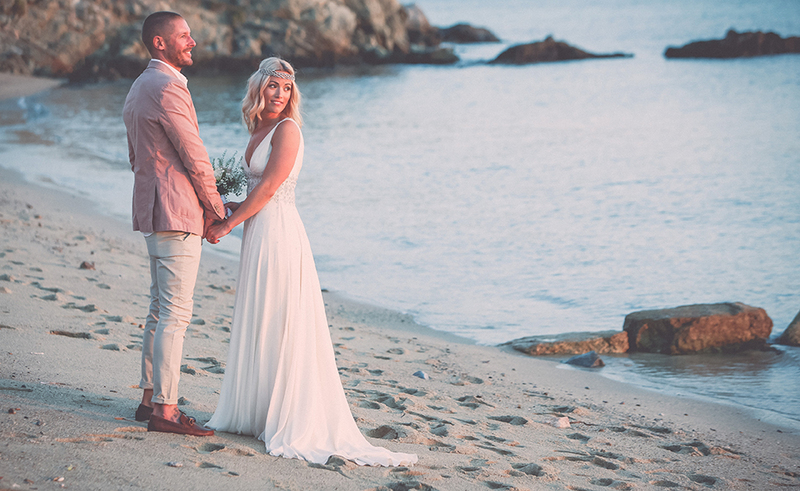 Amy & Neil wanted a rustic wedding on a lovely beach just before sunset, avoiding the peak of the heat, leaving enough time to take photos after a non-religious spiritual ceremony with a wedding celebrant they connected with. So timing was crucial as was finding the perfect person for the blessing. With nearly 60 guests it was important to find a venue that was reasonably priced, close enough to the town, beach, bars and restaurants so friends and family could enjoy a 2 weeks holiday as well as their wedding. They wanted to keep it simple, concentrating on the after party with guests and didn’t want to spend thousands upon thousands of pounds. The wedding followed the theme of Mamma Mia and was set on Hippie Fish which lives and breathes the most beautiful spot of the Agios Ioannis beach in Mykonos, Greece. We planned the entire wedding from start to finish. Helping the couple do a venue search which included, Ibiza, Majorca, Minorca, Italy, France, Spain, Tenerife, Croatia and a few other Greek islands before they realised Mykonos was the one. The couple chose to take a trip to Mykonos a year before the wedding and then again a few months prior to their big day. We totally transformed the entire space using the sky lanterns, large star fish, ribbons and wedding favours that they had selected whilst they were there. We had red carpet with rose petals lining the aisle, table decorations, a beautiful wedding arch and hand tied bouquet that were specially designed for the day. A stylish boat delivered the bridal party to the venue, as Amy was extremely anxious about how she would make an entrance without her guests seeing her – so this was perfect. A surprise from Neil to have three of their favourite songs play whilst they had their first dance, cut the cake and more dancing followed by a fireworks display and sky lanterns, which lit up the place to draw the evening to a close, which was truly magical. The couple then left their guests to enjoy the second week for a romantic mini-moon hotel. The couple loved every moment of the day and guests appreciated the mini bus transfers, dinner with traditional food, particularly the fresh fish (aka Hippy Fish) other areas of entertainment including the DJ who played all evening and was great fun and the free bar was a lovely touch. “Neelam absolutely made our wedding preparations stress free, as much as possible, she was fantastic. Without her creative input, patience and help over the past 12 months our wedding would not have been what I’ve only dreamt about. Neil and I just wanted to say a HUGE thank you, for taking such good care of us and making our wedding day the best day of our lives. We absolutely loved every minute of it. Our guests couldn’t stop telling us how much fun they were having and how unique our wedding ceremony was, which was just amazing to hear.